RISS offers law enforcement agencies and officers a full range of diverse and far-reaching services and programs to assist agencies, from the beginning of an investigation through the prosecution and conviction of criminals. An officer can query intelligence databases, retrieve information from investigative systems, solicit assistance from research staff, utilize surveillance equipment, receive training, and use analytical staff to help apprehend, prosecute, and convict criminals. Not all services listed below are available at all RISS Centers. Contact your in-region RISS Center for a complete list of services available. The services and resources offered by RISS are crucial to continue to ensure that officers and agencies can solve crimes and remove criminals from the communities in which we live. 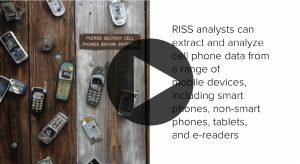 To view shared successes submitted by agencies and officers on how RISS has helped their investigations, visit the RISS Impact site. 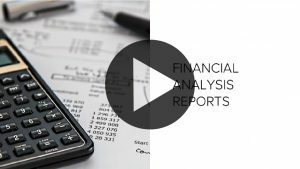 RISS analysts also provide their expertise during court preparation and serve as expert witnesses at trial. 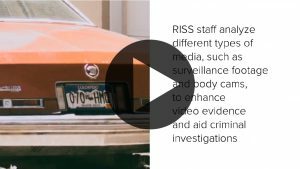 RISS intelligence research staff respond to requests for research and technical assistance and provide comprehensive intelligence and investigative research reports that aid in identifying addresses, witnesses, and other pertinent information. 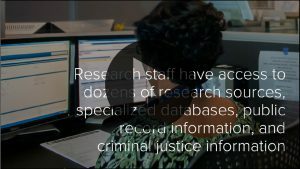 These research staff have access to dozens of research sources, specialized databases, public record information, and criminal justice information. Research staff search these resources, retrieve and compile information, and provide a comprehensive report of their findings to officers. This assistance helps officers in need of quick, accurate, and complete information. RISS member agency access officers may contact center staff by telephone, fax, or e-mail for assistance. Audio and video enhancements are commonly used in courtrooms to assist law enforcement and prosecutors in convicting criminals. 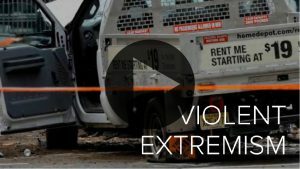 The enhancement of audio bites or video footage assists law enforcement personnel in identifying suspects. 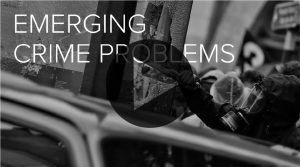 Audio enhancements are useful for undercover operations because analysts have the ability to remove background and frequency noise, enabling investigators to clearly identify the suspects. 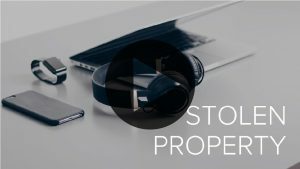 Analysts have the ability to enhance video footage in order to present a clear picture, which is extremely useful in robbery and burglary cases. Digital forensics focuses on the analysis and retrieval of information from computers and digital storage media. Digital forensics analysts uncover deleted files; locate evidence; evaluate the structure of computerized files; analyze other computer and cellular phone activity within hard drives, CD-ROMs, and JPEG images; and analyze e-mail seized during investigations. *This service is not offered by all RISS Centers. RISS Center equipment staff consult with and train member agencies on the use of equipment and provides expertise in developing specialized equipment. RISS provides one-on-one technical support to agencies through field services. Field staff from each center regularly contact law enforcement and public safety agencies to ensure that RISS is meeting their needs. The RISS Center field staff conduct on-site visits to provide technical assistance to member agencies and potential member agencies to facilitate delivery of RISS services. The RISS Centers provide training opportunities on timely and relevant topics, such as methods to combat terrorism activity and gang and violent crime; computer, financial, and economic crime; and emerging crime problems. Subject areas also include the use of specialized equipment, investigative techniques, analytical techniques, surveillance techniques, and officer safety. 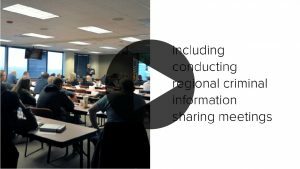 RISS Centers develop law enforcement-sensitive briefings and publications on topics, such as sovereign citizens, police ambush, human trafficking, and synthetic drugs. The RISS Center publications staff research, develop, and distribute numerous publications, bulletins, flyers, special reports, and other criminal intelligence publications that highlight local, regional, and nationwide issues. Examples include The Heroin Resurgence: A Painkiller Epidemic, Bath Salts: Deadly New Designer Drug, The New Face of Terrorism, and Domestic Terrorism and Extremism. The RISS Insider newsletter is distributed on a quarterly basis to educate RISS membership, federal officials, and partners on current RISS initiatives and efforts and contains RISS-related articles.